Our friend from California was in town for the Holidays and we invited him over for dinner and some wine pre-holiday ski trip. Our meal started off with shrimp cocktail, goat cheese, and crackers along with the 2010 Hugel Gentil. 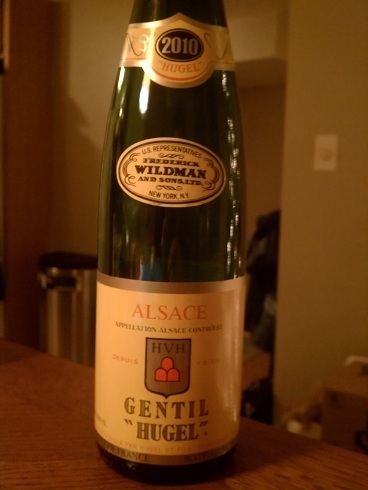 Gentil is a blend of “Noble Grapes” from Alsace. The blend contains the following grapes: Gewurztraminer, Riesling, Pinot Gris, Sylvaner, and Muscat. The idea is to showcase certain strengths of each grape in an all around wine that has been made in Alsace for centuries. This is a much older blend and isn’t really regulated like other French wines, it’s just been reintroduced to the market relatively recently. Therefore while it should contain at least 50% of the grapes mentioned it may actually contain other grape varietals as well. colonelgrape: 70. Meh. I was expecting something more exciting from this blend but all I tasted was a slightly dressed up Pinot Gris. I couldn’t taste any Gewurztraminer spice, Riesling sweetness, or Muscat grapiness. Maybe it was heavy on the Pinot Gris this vintage? Regardless it wasn’t terrible but it wasn’t as advertised. I’m not a fan but for $10 it’s hard to be upset…it did it’s job with the appetizers just not that well. MobyGrape: 74. The bottle looked pretty cool, but it looked better than it tasted. When I heard the blend of grapes I was ready to drink something sweeter (it’s highly probable that I tuned out after hearing riesling though). Turns out that was not the case, and this wasn’t sweet at all. I thought all these were supposed to be sweeter wines? Why did you lie to me riesling? Fine to pair with the night’s appetizers but I don’t know if I’d go out of my way to have it again. Better than chardonnay, but that’s not saying much coming from me. This entry was posted in Alsace, France on January 3, 2013 by colonelgrape.